Before I begin to describe the full OEM Idrive retrofit with dash removal, I would like to thank all the people who has posted some incredible valuable info on e90post and in particular thanks to Booster for his fantastic walk- trough guide of this retrofit. My previous experience with Auto Electrics/Repair is NON- existing. I change my tires twice a year but that’s it… No oil change, changing filters or any thing else. 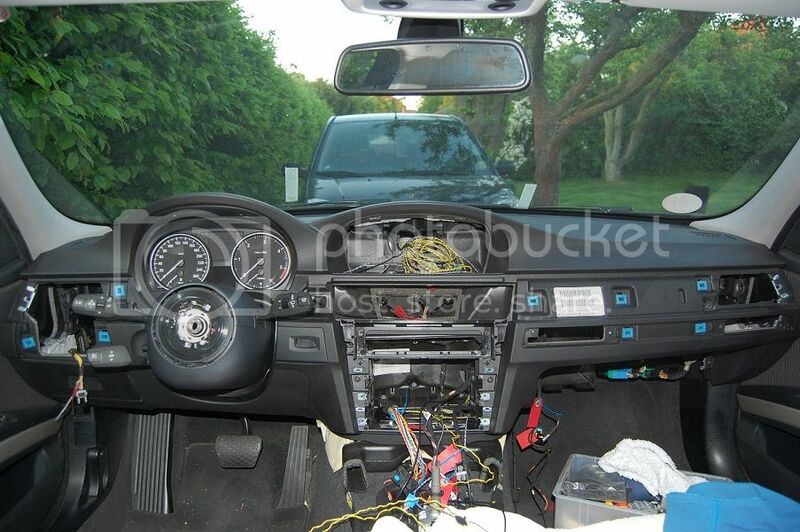 So my suggestion to you if you are thinking of doing this, but afraid it’s too complicated, I can say this: It requires a lot of preparation, but as for removing the dash and retrofitting the Idrive it is NOT rocket science. I was actually surprised it was not more difficult. 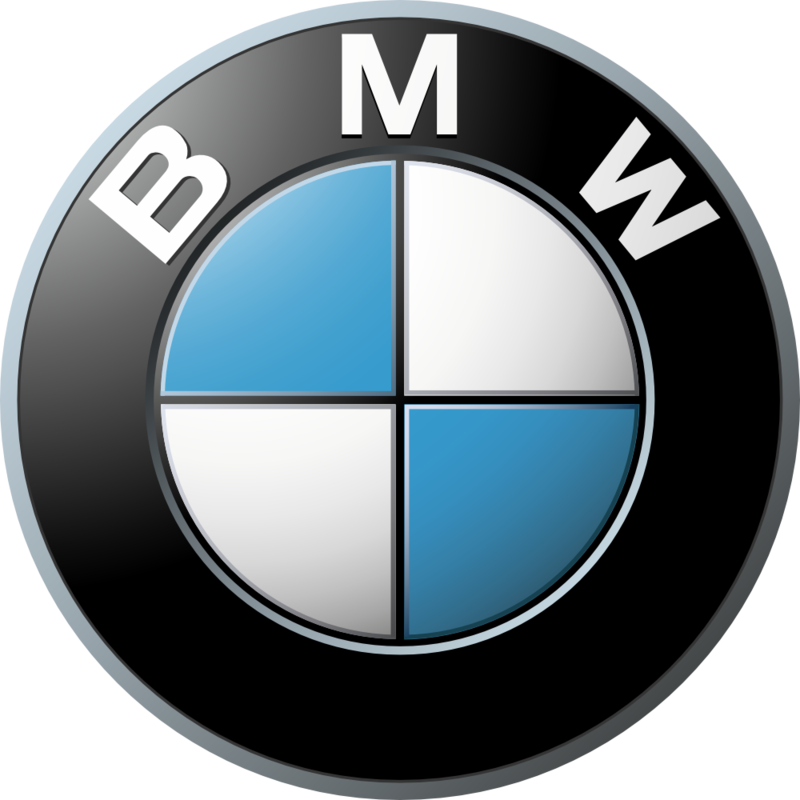 Secondly a thanks to Patryk from Bimmertech from who I bought most of the Hardware - Idrive unit, trims etc. I can highly recommend this Company. Quick response to questions(thanks for your patience Patryk), Hardware nicely packaged and all in fine conditions. Also thanks to MEN who did the coding(over the internet), all went smooth. 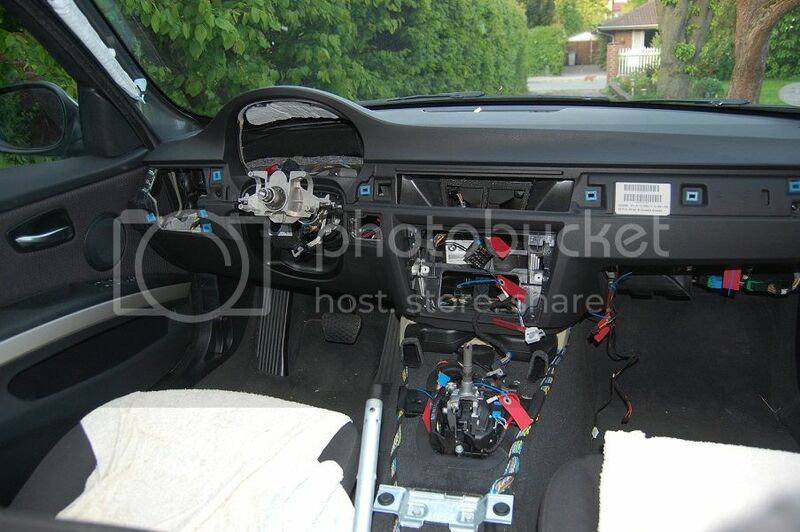 First some pictures from the dash removal. Removal of the AC unit. 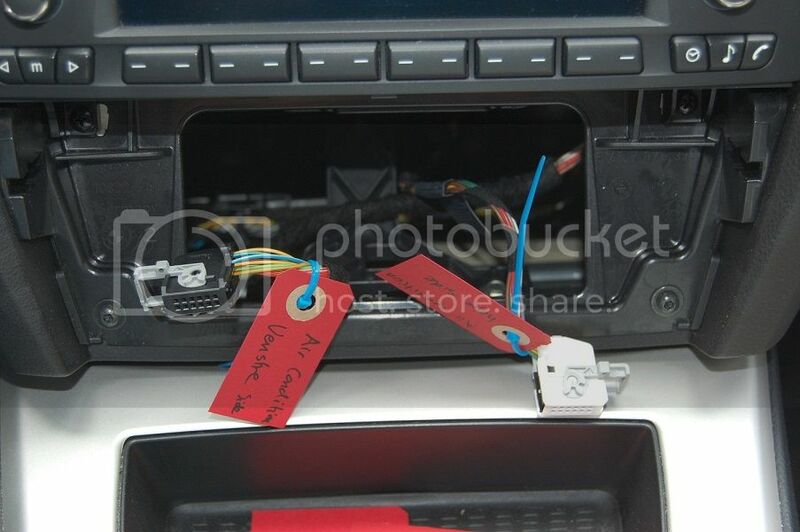 I was very thorough with marking all connectors with small signs(as you can see from the pictures) also Instead of putting all screws, nuts and bolts in a box, I taped them to a piece of paper and wrote location on them. I know it takes a lot of time, but at the end I ended up with zero bolt/screws missing or leftover. 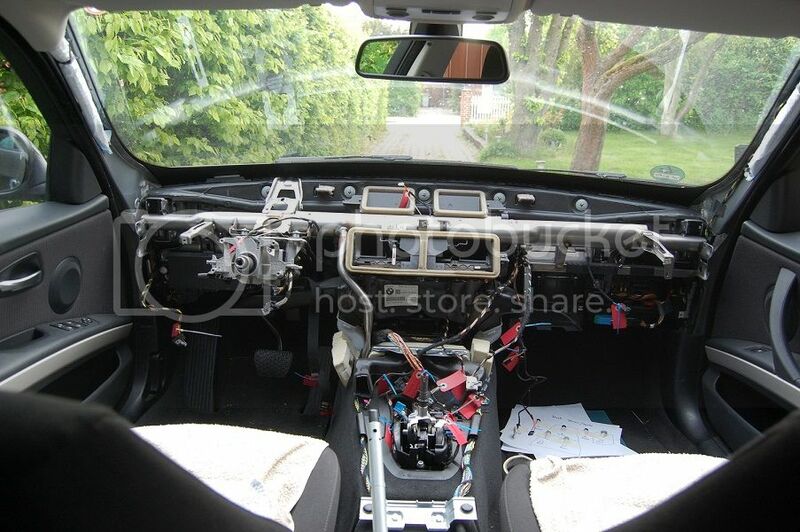 Steering wheel and airbag removed. Everything removed. 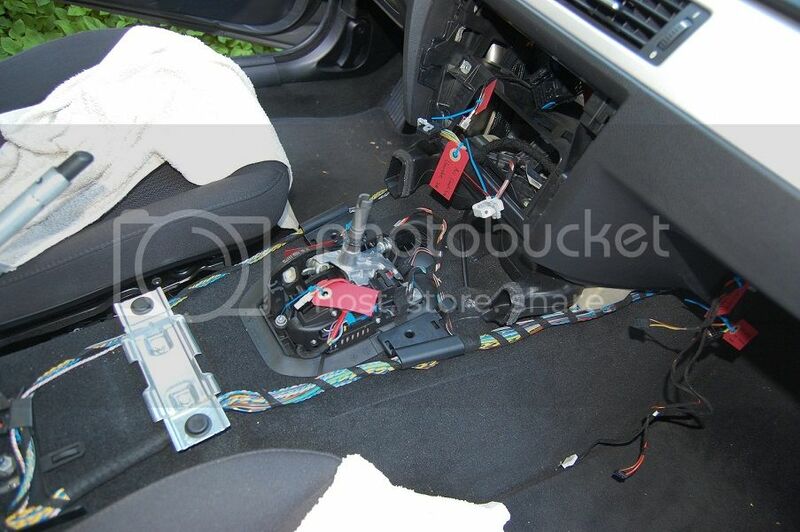 Only a handful bolts and screws securing the dash. Dash removed. Took about 8-10 hours to get there. Next was the wiring. There are 2 ways to do this. The easy way and the OEM‘ish way. I wired the CID to the Junction Box Electronic as described in the BMW WDS. As you can see from the pictures. There is a blue and black connector on the bottom on the Junction BOX. 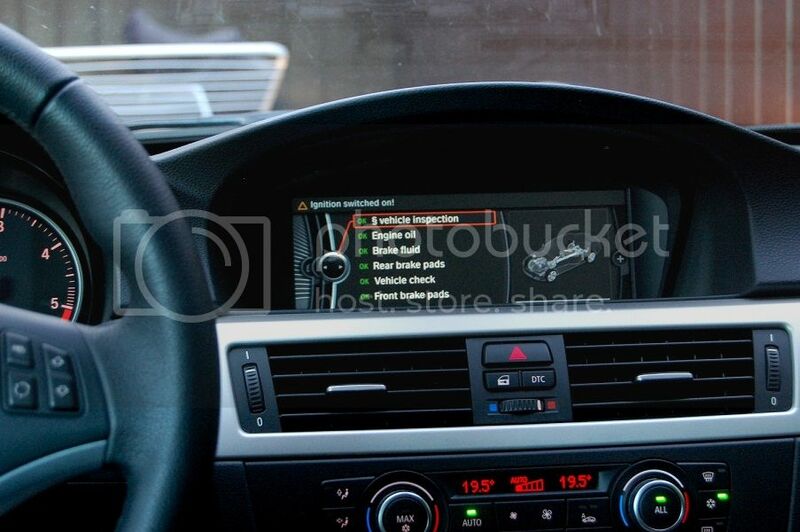 Every picture and thread I had previously seen, had the X14272 on the left and the X14271 on the right, well guess what BMW changed it around. Don’t know when(if it‘s with LCI), but mine is a MY2010, and the X14272 is the Black to the right!!! I could not find any info on this apart for some older pictures and threads on various forums, so it bought access to WebISTA, (30$ for 24 hours) and checked all wirings on the blue connector and afterward on the black connector and verified each wire color, and finally concluded . X14271(BLUE) on left, and X14272(BLACK) on the right. The Pin assignments WILL depend on what model year your car is. The remaining 3 wires (ground, K_Can_L and K_Can-H) have the same Pin assignments as later models. The wiring for the Controller took a little longer, because I again wanted to connect at least the Power for the controller, to the JBE as described in BMW WDS. The Power for the controller is found on the back of the Junction Box On a connector called X11003. This was really the most difficult part of the retrofit. It only takes 4 Torx 20 screws to loosen the Junction Box. I did not take any pictures a this point, because I was really struggling to reach the 4 screws( and it was very Hot at that time). Once the 4 screws are removed the junction box is held back only by the wires connected to it. The only wire to connect to the X11003 is the power from the controller. 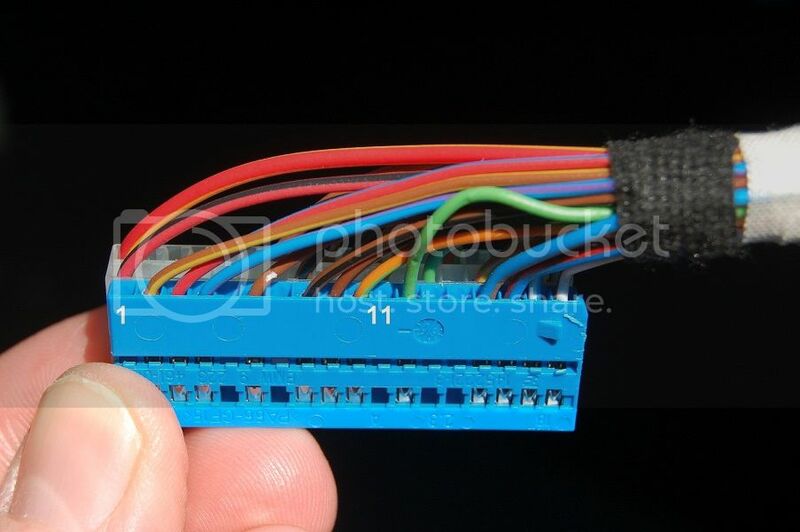 The wire color from the x11003 is suppose to be RED/VIOLET( BMW WDS), but the connectors I bought from BMW already has a Blue wire soldered to it so I used that instead. Afterwards it wrapped it in cloth tape and used a couple of strips to secure it the the OEM harnes. The rest of the wires from the Controller are tapped on the back of the CIC(with tap-in connectors ). 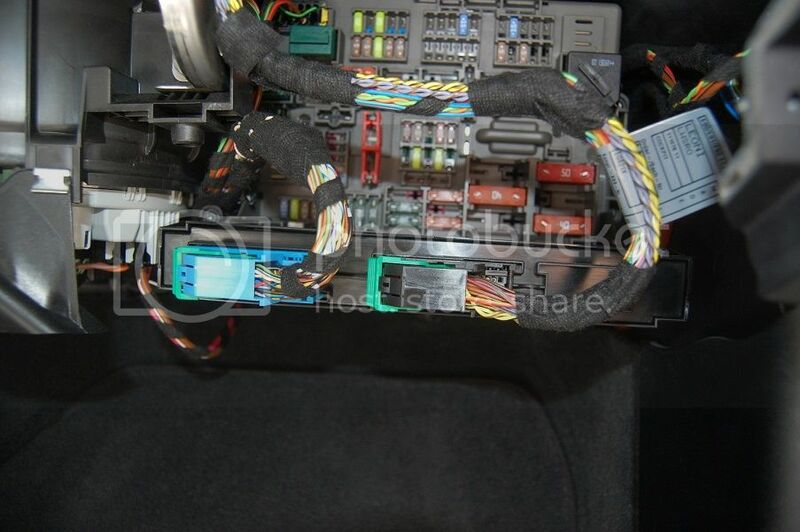 You can of course tap in on the Quadralock connector with all 8 wires (both from the CID and Idrive Controller)like I did with 3 remaining wires on the Controller, but according to Boosters retrofit guide it will throw some minor fault codes when a diagnostics- tester is applied. I haven’t tried though. How much for all the parts???? You are warrior class! Nicely done! I wouldn't be able to do this myself if my life depended on it lol. How much for everything? I have some questions; PM sent. BMW E93 Sold but not forgotten. What did this cost in parts? Where did you get the dash from? And did you need to change the AC frame at all? I got a new trim for the AC, as you can see it has shifted position(raised). That was included in the package from Bimmertech. well it wasn't cheap, but it was important for me that it was an OEM retrofit. I also bought the dash from new (it's actually surprisingly cheap, around 470 €). I also had to buy cupholders since I didn't have that on the old dash. With everything I have probably spend around 3000 € with everything. Package from Bimmertech, Dash, some other stuff and couple of tools. Some of you may be laughing at this amount, but keep in mind this option(from factory) is around 9000 € in my country. Is it CCC or CIC ? I'm also in the process of trying to retrofit this into my car. I have all the components but missing wires that connects everything. Would you happen to have the part numbers for those? Are you just reffering to the wires or also the socket pins and connectors? 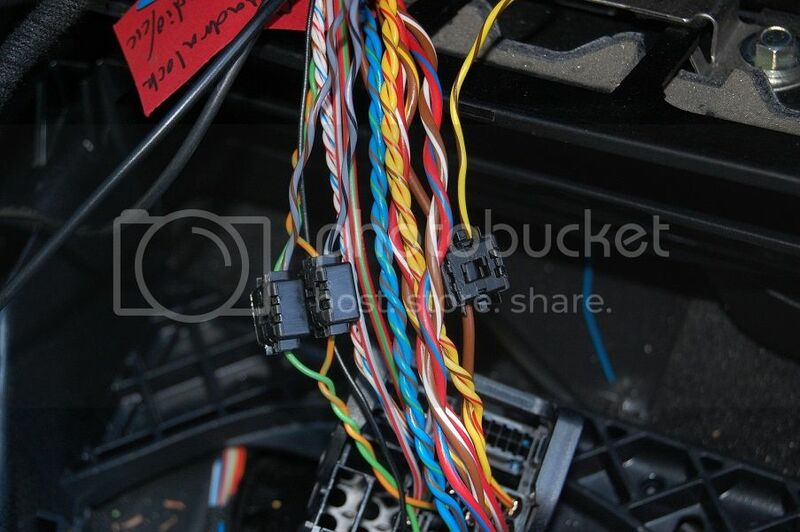 I believe the wires from a factory Idrive install, will be part of the OEM wiring harness and are not just a single wire you can order. 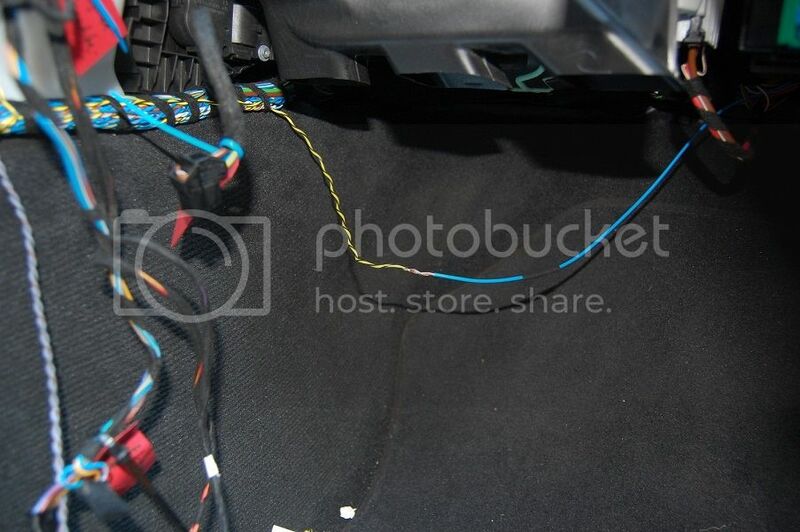 You'll to my best of knowledge have to use regular wires for car electrics, since there are no part-number for the individual wires that connect to the CID and controller. I got the wires shipped with the rest of the hardware from Bimmertech. If you need part the numbers for socket pins and connectors let me know. I would like to thank voucher76 for providing the missing part numbers for the socket pins and 4pin socket for the idrive controller which was the missing part of the puzzle for me to complete my CIC retrofit. Also with the help of your how to and Booster's how to; the install was relatively simple. I own a 320 pre LCi with idrive ccc and have recently upgraded to the new cic system. In order for Navi and voice commands to operate i have used the bimmeretrofit emulator board. All ok so far apart from speed dependant volume that is not operating and the climate control through idrive that is not displaying the zones to adjust air circulation. Do i have to change the climate controls to the LCI ones and if so is the cabling the same or not ? 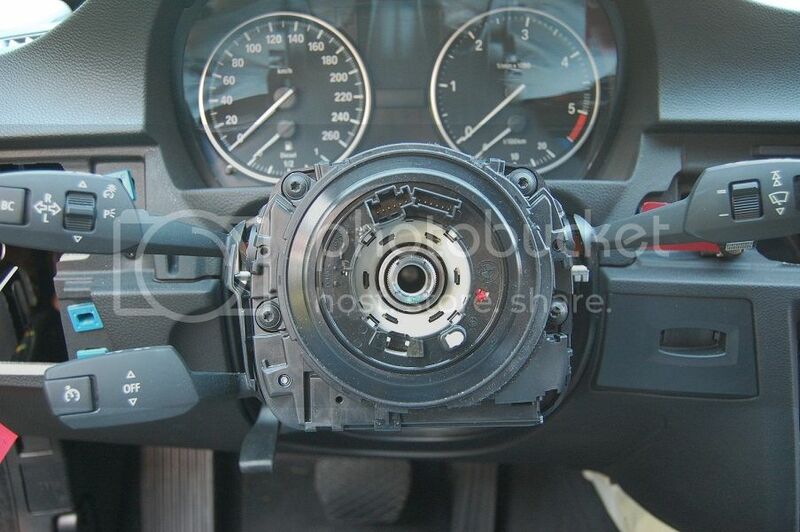 Does anyone know if the E90 dash is the same size and will fit the E92? im in the process of doing this retrofit and doing it the OEM way not caring how much it will cost me, all set and done with the CIC navi and the new dash it will cost roughly $3500 dollars. To my best of knowledge they are! Regarding the Idrive retrofit, I have deff not regretted. Best mod I have done to the car. yeah i was unfortunate to have no i-drive in my car when i bought it. plays a big part in the comfort of your interior with extra buttons and a nice screen with navigation and just makes the car feel more modern with all that touch of a button stuff im definitely doing it. better than having a Dynavin that doesnt even fit properly in the dash. but i will look into the link you sent me thanks alot. www.realoem is a very useful tool to find the part numbers, you can even use the last 7 digits of your vin, and it'll find your car. If you have further questions don't hesitate to ask.